Overall it is a good quality BASIC receiver for a low price. We switched from aan old pioneer d3s and I can only say that this reciever is excellent for sound reproduvtion and steup. Especially the dsp and dolby digital for movies it is just awesome.. it is a little hard to understand the owners manual but not if you are used to this type of system. the only real problem I have with it is a lack of on screen display, but at this price point I can get over that. All in all it is great for movies, the first one I tried it on was transformers and there was definintly a noticeable difference from the old reciever. Even my wife who is not into this sort of thing noticed. One thing I would recomend would be to buy a powerd subwoofer. We purchased the receiver to replace one we had in our home theatre. Pretty easy to install and hook up all compnents, but the connection to the sub-woofer was different than the original receiver so we have to convert. Sound is very good, great reception. Not as easy to use as original in selecting the type of sound we want (theatre, sports event, concert hall, etc.) Overall good product and seems to be a very good buy. How to get more than you are looking for. I had a entry-level Sony that died and was looking for a low cost replacement. The Yamaha is much more than that. The sound separation is cleaner and better than the Sony. The downside: It has so many more features than the Sony did that I sleep with the instruction manual. I guess if I was a pretentious "audiophile" I would look down on this because it wasn't $1000+, but it does everthing I was looking for, and more. If you want to be pleasantly surprised by a low cost receiver, this is the one. Best home theater receiver on the market for the price. I have a Bose 5 speaker home theater sound system with a Sony LED/LCD TV. 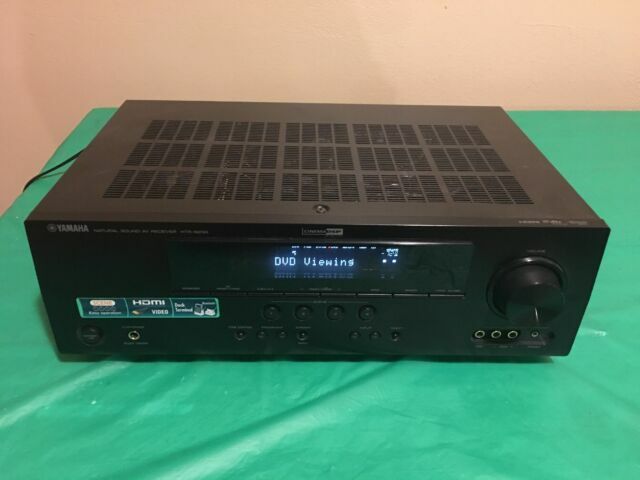 It was recommended that I use this Yamaha Receiver instead of the Bose Receiver with this system. It works great and is easy to operate. Especially for the price. I liked it so well that I have 2 of these receivers. My first one I purchased about 4 years ago. I bought this one because they may discontinue this model.